The Flow – Fly Fishing Blog – A Pennsylvania Fly Fishing Blog that lives life one cast at a time. A Pennsylvania Fly Fishing Blog that lives life one cast at a time. During this continued cold snap with a lot of our water froze over, fly tying season is in full force. Winter is as good a time as any to fill up the boat box. Here are a couple Gamechangers swimming off my vice lately with our river smallmouth in mind. Please “Like” The Flow – Fly Fishing Blog on Facebook: www.facebook.com/theflowflyfishingblog or Follow Blog via Email to receive future posts. Since 1983, the Department of Conservation and Natural Resources (DCNR) in Pennsylvania nominates rivers to select an annual River of the Year. The Little Juniata River has been nominated as a 2018 River of the Year finalist. Being voted as DCNR’s Pennsylvania River of the Year helps spread awareness and celebrate the resource. A river boasting DCNR’s PA River of the Year honors also aids with conservation efforts. If the Little Juniata River is voted the 2018 DCNR’s Pennsylvania River of the Year, the Liver Juniata River Association (LJRA) would be awarded $10,000 to be reinvested back into the resource. Bill Anderson and the LJRA already work on projects throughout the watershed involving stream bank restoration, riparian buffers, fish habitat improvement, and clean-ups. Additional funds would help fuel additional projects. As anglers our task for the Little Juniata River receiving this award is simple. All we have to do is vote online. Voting ends on December 22. If you haven’t yet, click HERE to vote for a 2018 PA River of Year. If you have voted already, share with someone else who loves the Little Juniata River. The holiday season seems appropriate for a time of year to consider new gear for that fly fisherman in your life. It could also be argued that this is a reasonable excuse to treat yourself to some new digs. Like a Merry Christmas to me, from me type of thing. Regardless of why you’re searching the web, here are some of my favorite gear options for this year. This fall brought the new Helios 3 from Orvis. Regardless of how you felt about the Helios 2, you need give the Helios 3 a chance. It’s safe to say that I 100% favor the Helios 3 over the Helios 2. The hype with this new rod from Orvis is real. The first generation of the Hatch Finatic was a favorite. With the improvements made to the second gen, this is a reel fly anglers will be sure to want in their arsenal. Performance and oh so pretty. With a variety of sink rate options, the Scientific Anglers Sonar Series has every depth covered. These lines are quickly becoming a favorite of anglers fishing for trout, bass, and musky. I’ve had my current Rogue Fleece Hoody from Simms for over 4 years. It’s jacket that with layering can meet the needs of many different temperatures. Purpose, style, and comfort. A very comfortable option for those cold days on the water. It’s a lot easier to be in waders during winter with a warm pair of pants underneath. There no such thing as too much tippet. The 3 pack option of Powerflex Plus from Rio makes sense. Save a little money, and put the tube they come in to good use holding flies. Strike indicators are a great tool. Airlock Strike Indicators are easy to adjust and do not kink leaders. These fly boxes quickly became very popular. Everybody could use a Tacky Fly Box to hold their flies. Even if you already have one, you could always use another one. Carrying and organizing articulated streamers can be a pain. Boat boxes are great, but not for wading. I have yet to get my hands on one of the Plan D Fly Boxes, but they look great for carrying some streamers with you for everyday wade fishing. Whether it’s for coffee in the morning or adult beverages later in the day, it’s easy for a fly fisherman to find use with the Yeti Ramblers. I’m using my 20z Tumbler daily whether it’s on or off the water. Water Conditions: The majority of this year spoiled anglers with great water conditions. In the last several weeks we did receive much rain, and because of that many of our rivers and creeks are very clear and lower. Flows are slowly getting thinner the longer we go without rain, but for the most part water levels are not much lower than average for this time of year. The water clarity being so clear presents more of a challenge than the water levels being lower. We could certainly use some rain to push us through the fall, but water temperatures are in great shape so the fish are pretty happy. Monitoring stream conditions on your local watershed prior to making he trip is always a good idea. See the Stream Flows page on the blog for a list of streams with USGS data. With the water clear and flows getting skinny the conditions are a little more challenging than most of this year. Although, it’s important to note that this year’s overall great water conditions really spoiled us. Nonetheless, some rain would certainly help push us through the fall. Spending time on the water during the lower flows can offer valuable lessons. The fish are still very catchable, but require anglers to be on their A game. Being cautious to splash and disturb water as little as possible pays dividends. Focusing on how to approach water and drag free presentations is key to putting extra fish in the net. Focusing on making the first cast/drift into a holding spot the right one will also put extra fish in the net. It’s a good time of the year to brush up on the angling skill set. When the water gets skinny, the faster water that is slightly deeper usually fishes more productive. The slower stretches of river usually present more of a challenge, but can also fish well during the right circumstances and approach. If you need a good low water primer, reread these 6 tips in a previous article – Trout Tactics for Low Water. The leaves are just starting to turn on some of the trees in our local area. It looks as though the warm weather will fade away for awhile as temperatures are forecasted to cool down for this weekend. The fall in Pennsylvania is a great time of year to spend on the water. Go Fish. And Go Penn State. The Flow’s Beer Guide to Fly Fishing: A series of blog posts about fly fishing that are in no way intended to help you catch fish. This series of blog posts will not help you cast farther, add new patterns to your fly box, or catch bigger fish than your buddies. These fly fishing beer related blog posts will add to your cooler, and increase overall angling satisfaction. Because there’s something about a day out on the water that just makes a beer taste even better. And because there’s something about a cold beer that just makes a day out on the water even better. At any given time I’m out on the water, you could find cold Busch Light in my cooler. It’s light. It’s cheap. And I’m convinced it’s good luck, it’s a fishy beer. A couple of my fishing buddies have come to expect a Busch Light if they are spending the day floating or fishing with me. I think some of them have come to enjoy it, and also drink it because they think it’s a fishy beer that brings good luck. Either that, or it’s the only option in my cooler. Using advertising such as “crisp and cold as a mountain stream” probably adds to the ambience of drinking a Busch Light while fly fishing. Busch Light also featured a fly fisherman in a recent television commercial. Which again, adds to the ambience. 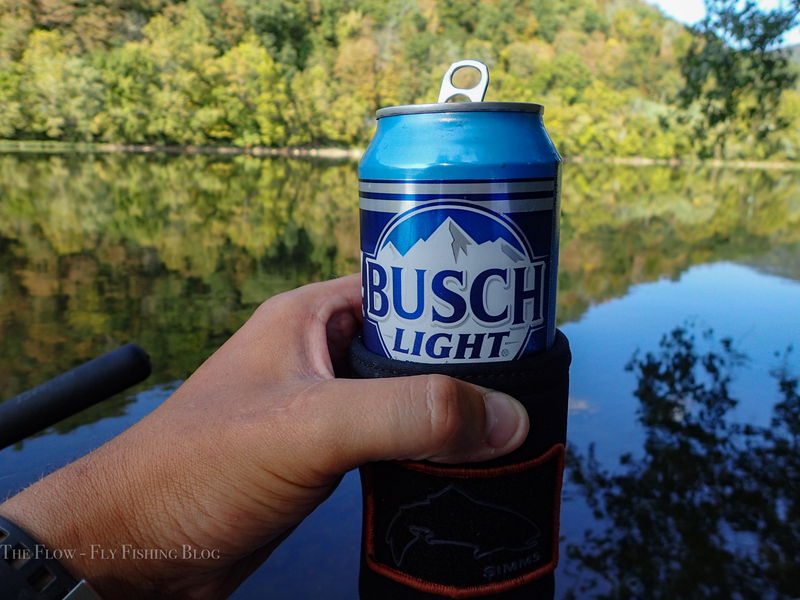 Busch Light seems to be a common can to find laying around rivers, but I doubt that has anything to do with fishing. Or maybe even people that don’t fly fish know that Busch Light is the appropriate choice for beer consumed on the banks of a river. But be responsible, don’t leave empties laying around. I’ve noticed over the years that I’m not completely alone. I’ve seen other fly fisherman expressing love for Busch Light. It makes sense to me. If you are a Busch Light drinkin’ angler, cheers. In the future, I plan to use this series of blog posts to highlight beers that are actually tied to fly fishing, or associated with fly fisherman. However, I couldn’t miss the opportunity to talk about my own favorite [fly fishing] beer, Busch Light. Since this post discussed my favorite beer for fly fishing, what is your go to beer for a day on the water? The Flow – Fly Fishing Blog Blog at WordPress.com.